The shelves of Bill’s den are meticulously lined with dozens of duck decoys. Bill knows each one personally. “I like the Black duck decoys best,” he explains. Inside the workshop of Bill Cordrey’s Long Beach Island home the fragrance of cut wood lingers. Several beam sized barn pieces of New Jersey cedar stand in front of drying cabinets filled with wood that line the wall. Wood carefully stacked by species fills the center of the room. Bill, an award winning decoy carver, picks up a shoebox size block of wood and turns it over in his hands “There’s a decoy in there. 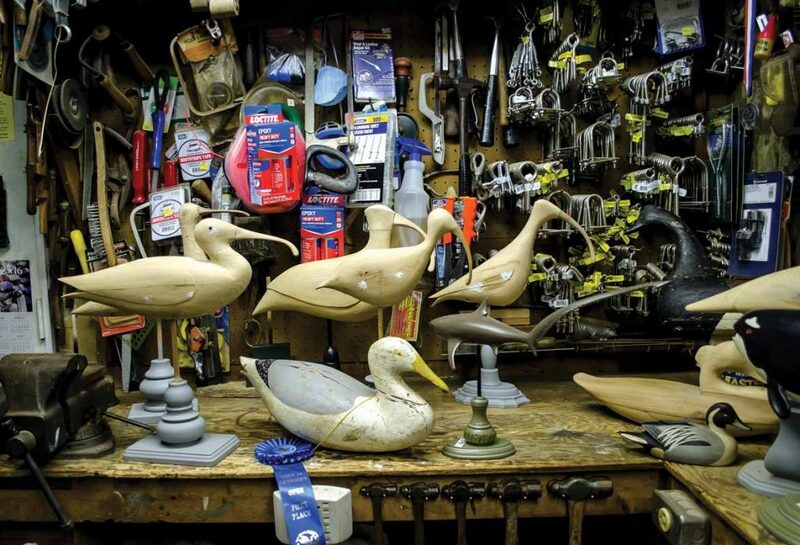 There’s one in every piece.” Decoys in different stages of completion fill his workshop as proof. Weather was never a factor in his younger days, “It didn’t matter if we were wet or nearly freezing to death – as long as we were fishing or hunting.” Necessity inspired Bill to briefly take up decoy carving. Decoys were expensive, and like many young teens Bill “lacked the money to buy them.” He stopped carving after building two dozen Black duck decoys. Over the years, he took up collecting instead of carving, amassing an extraordinary decoy collection. Bill retired in 2009 and found new inspiration in an uncommon and challenging carving style known as Modern Antique. It has become his passion. Carving in the Modern Antique style, Bill works to create technically exact replicas of antique and vintage decoys for competition. Bill has a preference for pre-Civil War decoys. “The antique decoys I work from are one hundred years old or older,” he explains. While technically exact, no decoy may be an exact copy of a particular antique decoy. Completed decoys must be branded with the date and initials of the carver. Time acquired nicks, dents, dings, shot marks, and even evidence of old repairs present on the original antique are carefully recreated. Decades of use, wear, and weathering are replicated through Bill’s perfected proprietary aging techniques employing physical, paint, and chemical processes. He has perfected imperfection. It is an art form closely resembling alchemy. Working directly from antique decoys on-hand, photographs, and his own patterns, Bill carves completely by hand using antique drawknives, spokeshaves, and small steel blades. He works painstakingly in the style of the original carver, employing the same ancient techniques, transforming blocks of wood into decoys that appear to have stepped out of the past. His award-winning Modern Antique decoys meticulously reproduce the grace, flow, and imperfections found in antique and vintage decoys. “New Jersey cedar, teak and apple are my favorite woods.” Foraged from old wood piles, salvaged or searched out, “The best wood is old, wide grained, and aged,” offered Bill. Some of the wood drying in the workshop is from local beaches and marshes. It is ideal for decoy building. Bill picks up old weathered wood pieces that have been washed in by the tides. “Sadly, after Hurricane Sandy some of the wood that washed up was recognizable” as part of one or another local structure destroyed in the storm. Standing in front of a floor to ceiling rack filled with a mixed-species flock of handmade decoys, Bill smiles as he gently shakes a completed Bufflehead decoy. It’s hollow and a muffled rattle can be heard. “Most antique decoys rattle. They were used for hunting, and most got shot through at some time.” He explains that hollow decoys are built from two carved-out halves. “I put a piece of birdshot inside so they rattle like the originals.” The primitive looking decoy in Bill’s hand bears shot mark into which pieces of chemically aged birdshot have been carefully fitted. “The shot holes are made with an ice pick,” he explains, noting that even the leather tie-down has been made to look appropriately weathered and aged. The metal weight on the underside appears ancient, and the black and white paint is weathered and scuffed to perfection. Skillfully replicated and imbued with the appearance of treasured folk art through the application of Bill’s artful carving and aging techniques, it is easy to believe this decoy was afloat on a misty morning a century ago. 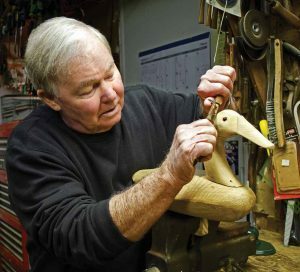 Bill competes annually in the “It Ain’t Vintage Yet” division of the Ohio Decoy Collectors and Carvers Show and has won numerous awards for his Modern Antique decoys. In 2010, his Labrador duck was awarded Best in Show. His Long-tailed duck (oldsquaw) drake placed second in 2011. In 2012, he won Best in Show and second place for his Curlew and Goldeneye. Additionally, in 2012 Bill was honored with induction into the New Jersey Decoy Collectors Hall of Fame as Collector of the Year. His Red-breasted Merganser drake was awarded Best in Show and his Curlew won second place in 2013. In 2015, Bill again won Best in Show for his Curlew. His Black duck took second place. Most recently, Bill won Best in Show and ten other awards at the 2016 Ohio Decoy Collectors and Carvers Show. Bill continues to enjoy carving, and competing locally, nationally and internationally. 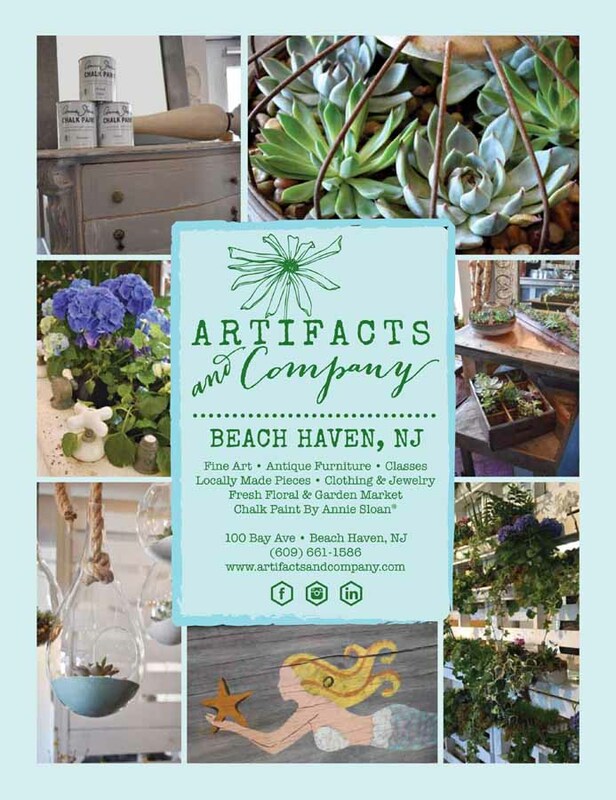 During our interview for the Spring into Summer 2016 edition of Echoes of LBI, award-winning decoy carver Bill Cordray graciously offered to look at my ugly little flat “bird on a stick.” I purchased the crudely made bare wood silhouette of a bird with a broken bill and chipped tail decades ago at an estate sale for one dollar. I believed it was a high school wood shop project failure but was surprised to learn it’s a “Flattie” – a Black Bellied Plover decoy carved around 1880–1910. Lightweight and less expensive to make, flatties are silhouette decoys that were staked into the ground to attract shore birds. My little “bird on a stick” had been standing on top of our kitchen soffit attracting dust and nearly forgotten. “He’s not valuable,” Bill advised, “but he is old and made from a single piece of wood that was probably taken from a piece of very old furniture.” In his Long Beach Island workshop with period-correct paint, Bill expertly revived the duck by refurbishing its tail and adding a new bill. 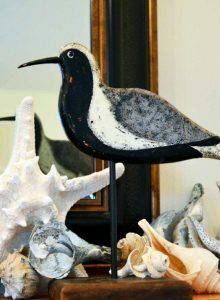 The little flat Black Bellied Plover is now a personal treasure.